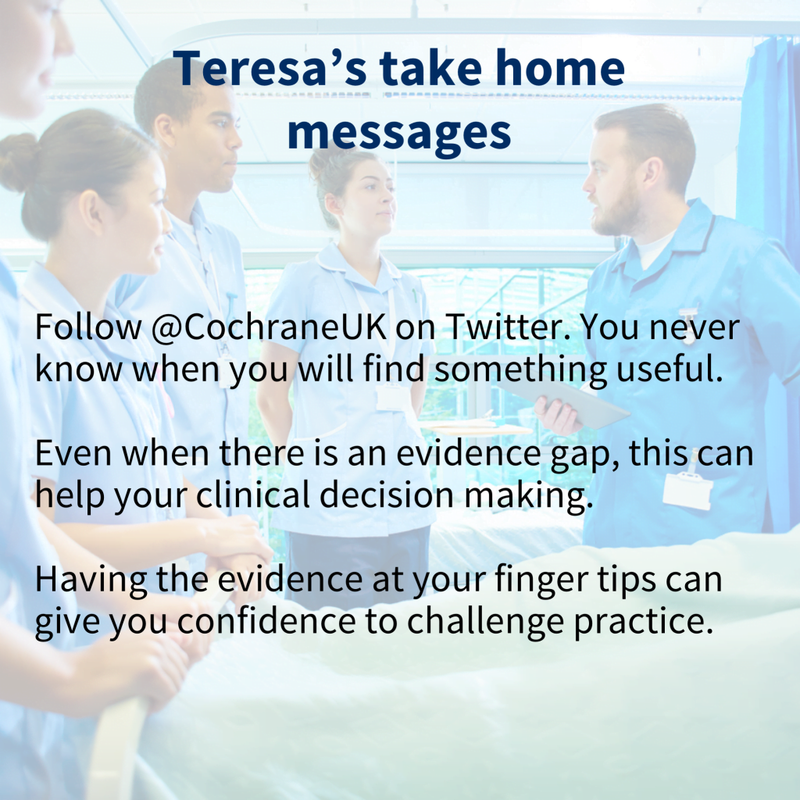 In this blog, We Nurses founder Teresa Chinn (@AgencyNurse on Twitter) reflects on how learning about Cochrane evidence on catheter washouts, via Twitter, enabled her to challenge and change her patient’s care. ‘A Cochrane Review lightbulb moment’! A few weeks back I was scheduled to do a clinical shift at a local care home where I keep my clinical skills up to date by working some bank shifts. The shift was going well and I was managing to juggle all the work that needed doing until I noticed that one of our elderly gentlemen was due to have a urinary catheter washout. The gentleman had a long term supra pubic catheter in place and had recently returned to us from hospital following complications with the catheter blocking and bypassing. I saw that he had not had a urinary catheter washout since he had returned from hospital and it was then that I had a Cochrane Review lightbulb moment. I was dubious that the washouts were working for this gentleman and this was fuelled by a rather sketchy printout that was in the gentleman’s notes regarding washouts. The printout cited some evidence that was 15 years old. This left me concerned. I was also concerned with the bias of the printout – as it was written by the washout manufacturer. It was then that the part of my brain dedicated to filing away “useful stuff” kicked in and I recalled seeing the Cochrane Review on urinary catheter washout solutions… I whipped out my trusty mobile phone and googled it! I spent the next 5 minutes or so reading the review – which basically stated “There was not enough good research evidence to determine if catheter washouts were useful.” Which left me with a bit of a dilemma…no good evidence – an evidence gap! I then spent the next 5 minutes worrying! As a bank nurse it’s quite hard to speak up and to raise issues with practice. Not only do you not know the people being cared for quite so well, there is also a whole load of team dynamics and not wanting to be seen as a know-it-all to contend with. So I mustered a bit of courage and approached the other nurse who was on duty. I expressed my concerns that this gentleman had been using urinary catheter washouts for some time and he still had to be admitted to hospital. I showed her the Cochrane Review and I also showed her the printout and expressed my concerns with it. I then mentioned the NMC Code and that it states that we must “always practise in line with the best available evidence” (NMC, 2015). We had a conversation about what we do when the evidence says there is no good evidence. We both came to the conclusion that in this case we needed to go on what was working for this particular gentleman. In this case the washouts seemed to not be helping and could, perhaps, even be not helping! I stated that I would be very uncomfortable in administering the washout and she agreed. We then went and had the same conversation with the gentleman in question and he also agreed. We decided that we would not administer the washout but we would keep the gentleman under observation for the next few weeks just to ensure that stopping them was the right decision. I documented the decision and included a link to the Cochrane Review and a full breakdown of our thought process. Although in this case the Cochrane Review pointed to an evidence gap it still empowered my practice. Without the review, I would have not felt confident enough to raise the concern and to have the conversations that ensued. Having analysed and pondered upon how I recalled the review I can really only put it down to Twitter… I must have seen a link and clicked on it and then was somehow subconsciously able to recall it when it was needed… it really must be wizardry! Whatever it is, I certainly won’t be unfollowing @CochraneUK…EVER – and now I’m following @C_Incontinence too. As for the gentleman, he has had no further problems and looks really, really well… the best I have seen him in years! 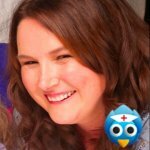 Join in the conversation by leaving a comment on the blog or tweeting @CochraneUK @AgencyNurse @C_Incontinence. 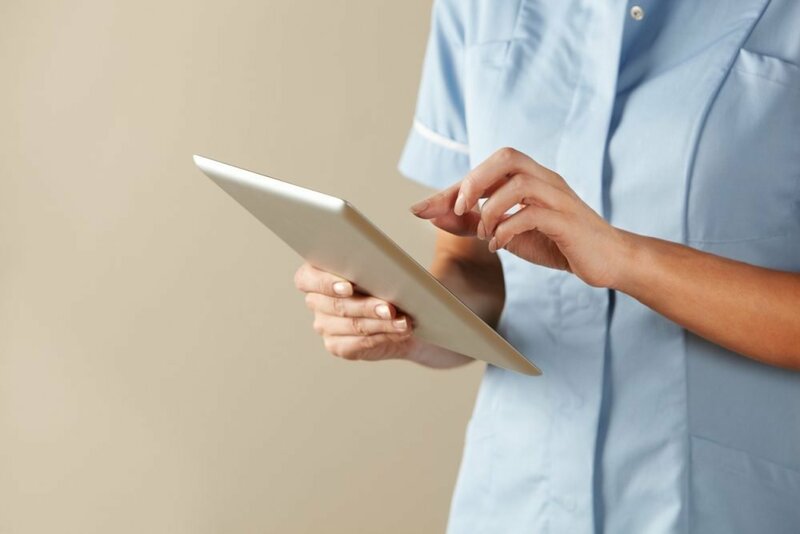 You can also follow our ongoing ‘Evidence for Everyday Nursing’ series (#EENursing), which includes several blogs on urinary catheter evidence and practice. Whilst ‘not to treat’ is a valid treatment choice, and appears to have been ok in this scenario (for the short term, but what about long-term encrustation? ), presenting it as an isolated blog, without reference to potential benefits of washouts, may have the unwanted effect of deterring nurses from washouts in general. I have seen catheter washouts really work. Yes the evidence isn’t yet there but in the meantime, we need to present a balanced view. We need to know more about the patient’s catheter history – were washouts harmful to him? What procedure did he have in his recent admission? Did you consult the MDT? Why had he been prescribed washouts? Have you seen washouts work? Whilst we await the evidence, we cannot conclude against washouts as a general rule.